As reported in the article on the 13th annual meeting of the European Flood Awareness System partners, SEPA and the forecasting service are part of this international forecasting initiative, and receive notifications when flooding is expected. As part of our input to the meeting we submitted a poster, jointly with the Flood Forecasting Centre. This entry provides a little more detail on the Scottish events covered in the poster. It was a quiet year, with most of the activity being taken up with low level river and surface water events, or coastal event outwith the scope of EFAS. As can be seen below, only one EFAS notification was received during the year, for the north east of Scotland on 6 June 2017. What is interesting is that on the same day there was surface water flooding in parts of the Central Belt, including Edinburgh, which was not picked up by EFAS. This illustrates some strengths and weaknesses of the system, which is more geared toward large rivers – even our larger watercourses mostly fall more within the remit of the Flash Flood notification remit – than surface water flooding. Additionally the event in the south of Scotland during January 2018 was missed by EFAS, though it was forecast to some extent by SEPA’s own models – the run-off was caused at least in part by snow melt, which all models can struggle with. There were no EFAS false alarms for Scotland during this period. 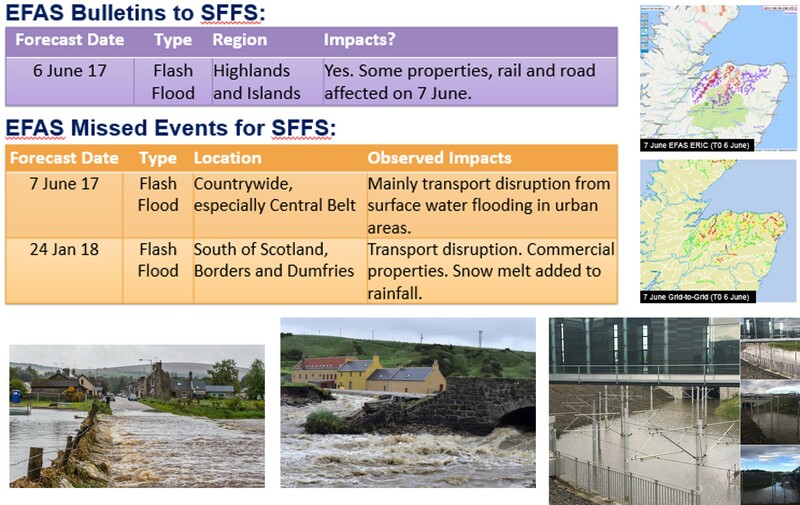 The lesson identified is that for the types of events that we see in Scotland, EFAS can be useful to help add confidence to our own forecasts, given that the source models (ECMWF weather and LISFLOOD for rivers) are independent of our own. But not everything is captured, particularly surface water events, so we should be wary of relying on it in isolation. This entry was posted in EFAS, Forecasting, Surface Water. Bookmark the permalink.